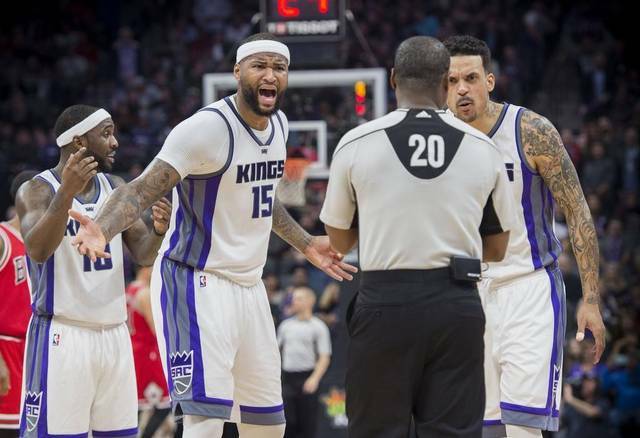 On Sunday night after the All-Star game, Sacramento Kings‘ DeMarcus Cousins was traded to the New Orleans Pelicans for Buddy Hield, Langston Galloway, Tyreke Evans and some future draft picks. Almost immediately, the national media began torching the Kings for the trade and it has not stopped yet here on Tuesday morning. I am watching Skip and Shannon on FOX1’s Undisputed right now and they are still torching the Kings for basically giving away DeMarcus Cousins. It pains me to see my Kings getting laughed at nationwide. I was born in Sacramento and have been a Kings’ fan ever since they moved to Sacramento from Kansas City back in 1985. I will never forget it. I was a teenager back in 1985 when businessman Greg Lukenbill brought the Kings to Sac-Town. Like the team of today, That first Kings team back in 1985 was god-awful. But you know what? We Sacramentans didn’t care because they were OUR team! They had players like Terry Tyler, LaSalle Thompson, Larry Drew, Reggie Theus, Mike Woodson and Otis Thorpe. Then, in 1998, the good times started to roll for us Sacramento fans. We put together a great group of players. We had Chris Webber, Mike Bibby, Vlade Divac, Peja Stojokovic and a young, flashy point-guard named Jason Williams. Now we fast-forward to today’s team. The Kings are horrible again. I will agree with the national media when they say that this Kings’ management has been a joke and a laughing-stalk for the way they have handled their draft picks. CASE IN POINT: See Isaiah Thomas. But after saying all of this, I am glad they have shipped DeMarcus Cousins out of town. It was time to move on. Yeah I know they could have maybe gotten more in return for Cousins but now they can start fresh again. Yesterday I was listening to Kings’ announcer Grant Napier’s radio show on KHTK 1140 and he had some great points. Grant said he was glad Cousins is gone and now the Kings have their franchise back. Grant also said he will be glad to call a game where he won’t have to see DeMarcus Cousins whine about every bad call he gets from the referees. Look, as a Kings’ fan, I loved DeMarcus Cousins as a player. He has done a lot of great things for our Sacramento community. He will be missed in that aspect. The only thing that bothered me and other Kings; fans about Boogie is the fact that he was a hot-head and could not control his anger on the court. He has been in the NBA for 7 years now and still goes off on referees and is leading the league in technical fouls this season. Now Cousins begins his time in New Orleans for the Pelicans. I hope the best for him, I really do. He will team up with Anthony Davis now and they will be hard to stop in the paint. And you know what? If the New Orleans Pelicans go on and become a major force in the NBA, I will still agree with Vlade Divac’s decision to get DeMarcus Cousins out of town. So let Stephen A. Smith, Max Kellerman, Shannon Sharpe and old-man Skip Bayless laugh at us, I don’t care. To repeat what Grant Napier said on his Twitter account, “The Kings now have their franchise back!”. It was time for DeMarcus Cousins to get out of Sacramento.